First it was done in studios, then in your bedroom, and now pretty much anywhere you like; in 2017, music can be made in all manner of different ways and situations. Now, Focusrite wants to find out more about the way that you compose and create your tunes. What kind of gear do you use, and what inspires you? You might also have some thoughts on what your setup is missing, and the hardware and software that would take it to the next level. The company is asking you to complete a survey on your music making habits; in return, you’ll be entered into a prize draw. 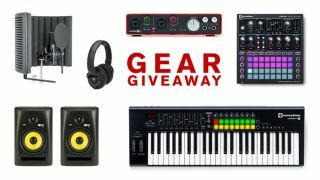 One lucky MusicRadar user will be chosen at random and receive the below bumper bundle of top recording and production tech, worth over £1500. So, click here to fill out the survey - it should only take around 10 minutes - and to be in with a chance of winning all that lovely gear! *The winner will receive their Circuit Mono Station separately as soon as it becomes available in July 2017. The rest of the prize will ship shortly after 8th June 2017.